Local experts give insight to achieving a natural, sun-kissed look without the use of harmful rays. Here’s a wish for all brides: May your marriage—and your skin—be beautiful for a lifetime. On both counts, it helps to start out with a healthy foundation. Take care of your relationship, day in and day out. Likewise, take care of your skin. 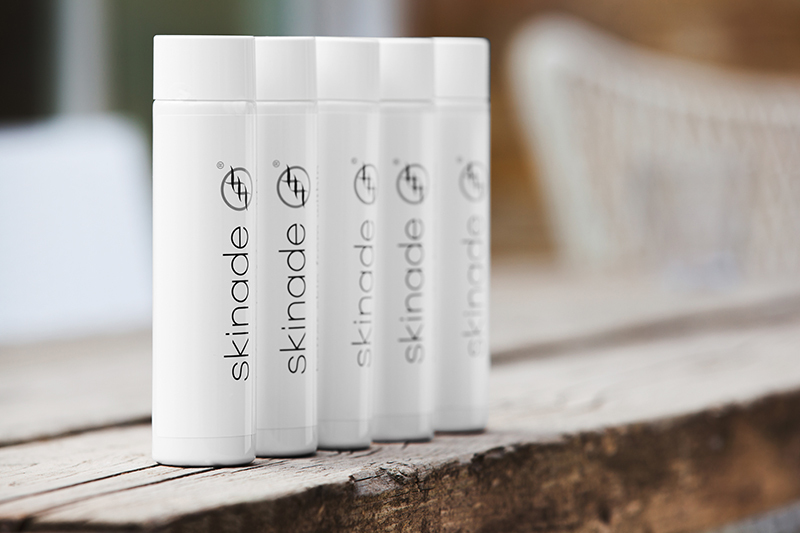 Like anything worth having, you may have to work at achieving a fabulous complexion. And even if you are blessed with a flawless face, you will have to take steps to preserve that youthful glow. So why not start now? Cultivating a glow need not stop when you walk down the aisle. Make your heightened awareness of skin care a springboard for a regimen for the years to come. 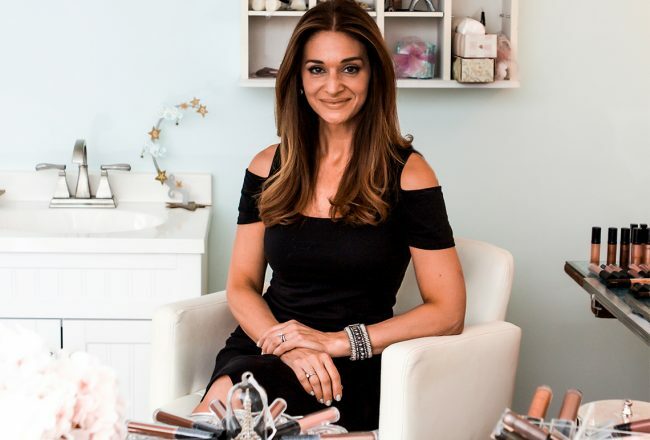 To determine what your skin needs to look and feel its best, start with an analysis, advises Ellie Ragheb of Salon D’Artiste in Wayne Pa.
“We look at oiliness, dryness and sensitivity to come up with a plan,” she says. 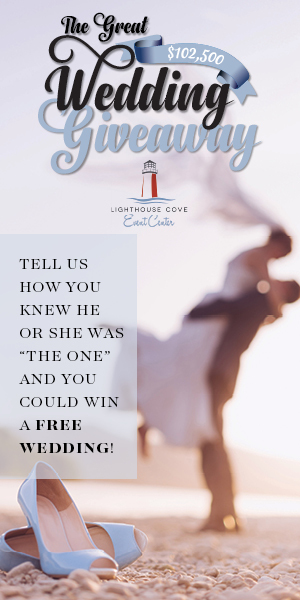 Ideally, the bride approaches skin care with the same dedication with which she shops for her gown and tours prospective venues for the reception. These tasks can’t wait until the last minute—and neither can skin care. For optimum results, a skin care regimen begins at least six months in advance of the wedding. But don’t despair if your timeline is shorter. No matter her skin type, most brides will benefit from facials that infuse the skin with vitamin C.
“It’s an antioxidant and makes the skin look brighter,” she says. Remedies for dry skin include hydration, a high-intensity moisturizer and a daily cleanser formulated for dry skin. 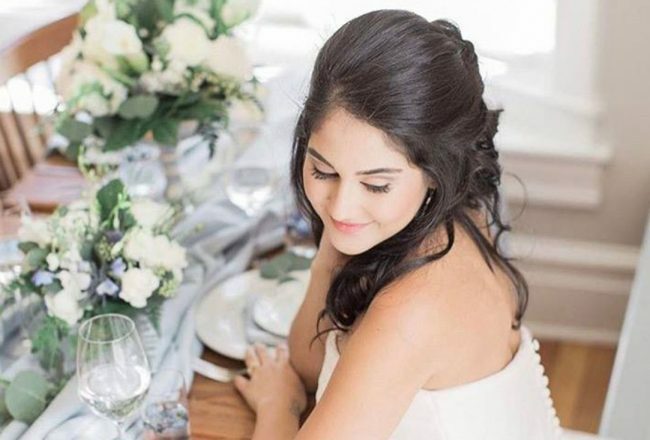 To prepare for a day when all eyes are on the bride, the bride should ensure that the skin around her eyes is as perfect as her hair and makeup. “If there is any puffiness around the eye, there are very good creams that we use to reduce any appearance of swelling,” she says. Don’t neglect the skin on your body. Exfoliate your arms and legs regularly, perhaps twice a week during your shower. Want to give your skin a do-it-yourself wake-up call the morning of the wedding? Get yourself perking with a coffee scrub. Blend together the grounds from coffee (regular, not decaf) with coconut oil. Start with your feet and work your way up your body to the neck. Then shower away. Apply lots of moisturizer while your skin is still wet. While you are at it, pamper the skin on your face. SheaMoisture makes an in-shower mask that combines green coconut (rich in minerals, vitamins and oil) and activated charcoal (it lifts dirt and oil) that deeply purifies and hydrates skin while you shower. 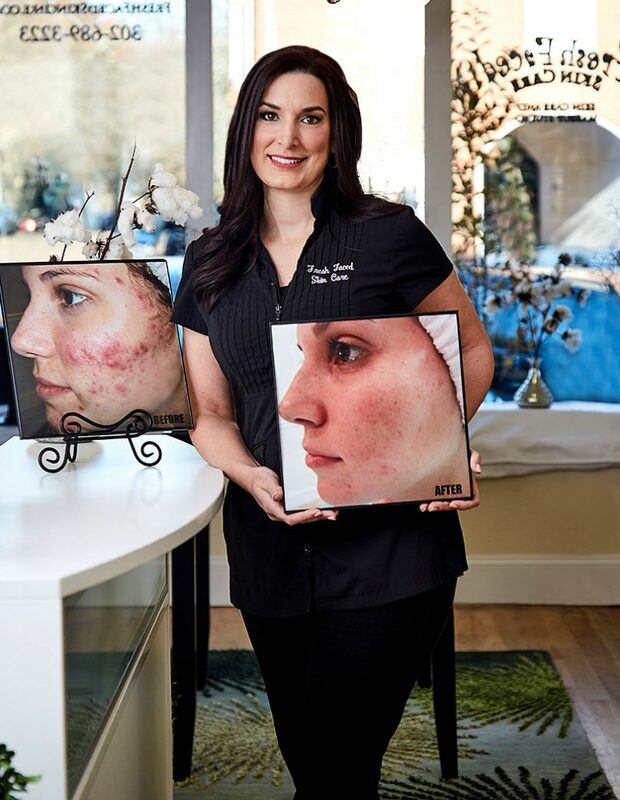 Erica Suppa is the founder of Fresh-Faced Skin Care in New Castle, Del., and Chadds Ford, Pa.
Erica Suppa, founder of Fresh-Faced Skin Care in New Castle, Del., and Chadds Ford, Pa., specializes in treating troubled skin. For brides prone to breakouts and other problems, she recommends starting at least six months before the wedding date. “Skin has seven layers and it take time to get through that,” she says. Her regimen for treating acne typically begins with a chemical peel. Often, brides and their mothers come together for skin care in preparation for the big day. “At the very least, the moms want a red carpet facial to look good for the photos,” she says. Sun damage is another frequent concern, even in women in their 20s who have overexposed their skin tanning outdoors or in tanning beds. Don’t blame yourself for such issues as enlarged pores. Blame Mother Nature, and then do your best to minimize the problem. Trained as a bioscientist, Suppa has formulated her own skin care products and cosmetics. The line includes cleansers, serums, moisturizers, sunscreen and other skin aids. She is a skin care coach, who checks in with clients between appointments to answer questions and monitor their progress. She is an advocate for a regimen that is streamlined, with minimal products and steps involved. 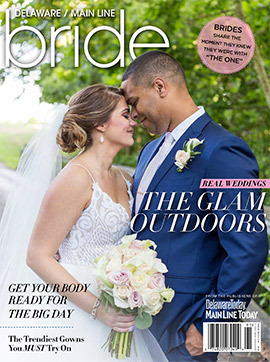 Erica Suppa recommends brides who are prone to breakouts start treating their troubled skin at least six months before the wedding date. Expect it to take three to four months to clear up skin. But don’t stop treatment after the honeymoon. Keep up the good work. “You have to manage breakout-prone skin for the long term,” she says. At the Aesthetic Center in Lewes, Lisa Brown advocates for a holistic approach to achieving a radiant complexion. “Healthy, glowy skin starts from within,” she says. 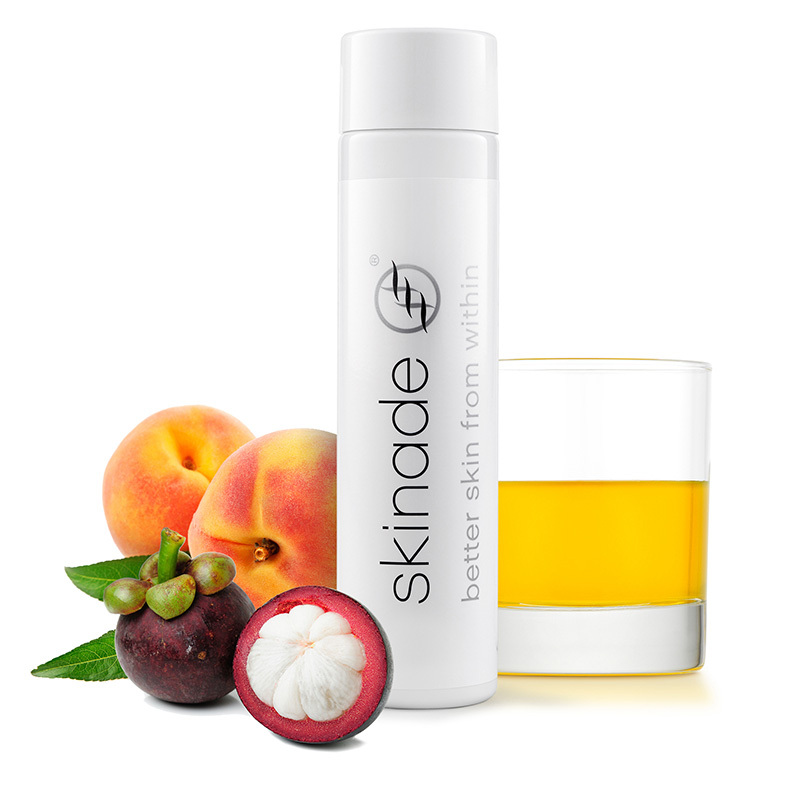 Skinade leaves skin hydrated, plumped up and smooth. It takes at least two weeks to see a difference and the makers recommend starting with a 90-day regimen. The first step is evaluating the skin and establishing a program. Chemical peels and laser treatments that reduce fine lines and hyperpigmentation should be done well in advance of the big day. Skin care is not a one-size-fits-all approach. Each individual requires a personalized angle. The center carries Obagi, a full-spectrum skin care line developed by a dermatologist. “It starts with cleansing and goes from there,” she says. One habit everyone should embrace is regular use of sunscreen, even during the winter. It should have SPF 30 or higher and be part of a daily routine. To reduce fuss, Brown suggests exploring products that do double duty. “You can save a step by using tinted moisturizer as a foundation,” she says. Just before the big event, she recommends a glow peel, which is a mild, exfoliating treatment that removes dead, dulling cells to reveal new, dewy skin.